This is the write up that appeared on the California Chips website. We have include it in full because we haven't heard from them for a while and the website has closed down. 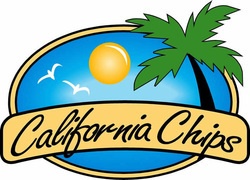 ​California is a great state and every state should have their own potato chip, right? So we figured California should have its own potato chip. It should be cooked, flavored and packaged with the heart of California in mind. California has wonderful fresh potatoes from the fields of Bakersfield and Bishop, pure Sunflower Oil from Northern California and flavorful salt taken right from the San Francisco Bay. California has what it takes to make great fresh potato chips so we decided to give it a shot. So in 2000 we started working day and night to get our little potato chip factory going. Just a few dedicated souls that believed in the dream built this Factory of Dreams. We figured if Ben and Jerry could turn an old gas station into an ice cream factory we could turn an old sea urchin processing plant into a potato chip factory. We didn't pay anyone with a lifetime supply of product to get going like Ben & Jerry did but we are still filling IOU's for potato chips to those many folks that gave us a little help to get started. Six months later we were ready and filled up the fryer with fresh vegetable oil and drove up to Bakersfield, where they grow spuds as far as the eye can see. We filled up our truck with those golden spuds and we were off. That first day we only made 10 bags of potato chips but they were the best 10 bags of potato chips ever made and probably the most expensive! ​It was that day we realized that something great had happened. Somehow all those California potatoes, oil and salt cooked up right here in California turned into just about the best potato chips anywhere. Today we use over 25 tons of potatoes per day and a whole heck of a lot of everything else. But the chips are still the same crispy crunchy wonders that came out the fryer that first day. We use California grown ingredients whenever possible. We’ll keep on making chips as look as they always taste great and we are still having fun. And if we make enough chips before 2 PM then Ted, the production guru, can leave early and go wind surfing. Hey its California, we can’t work too much! Thanks for your support and keep on crunching!